This corner building comes with sub base C and its boardwalk decking enabling it to fit seamlessly along the boardwalk on ‘the corner of main’. This is a feature building with large shop windows it also has glass (acetate) shop windows with painted advertising of his trade. All doors (exterior and internal) are pin hinged and this building has an internal staircase. 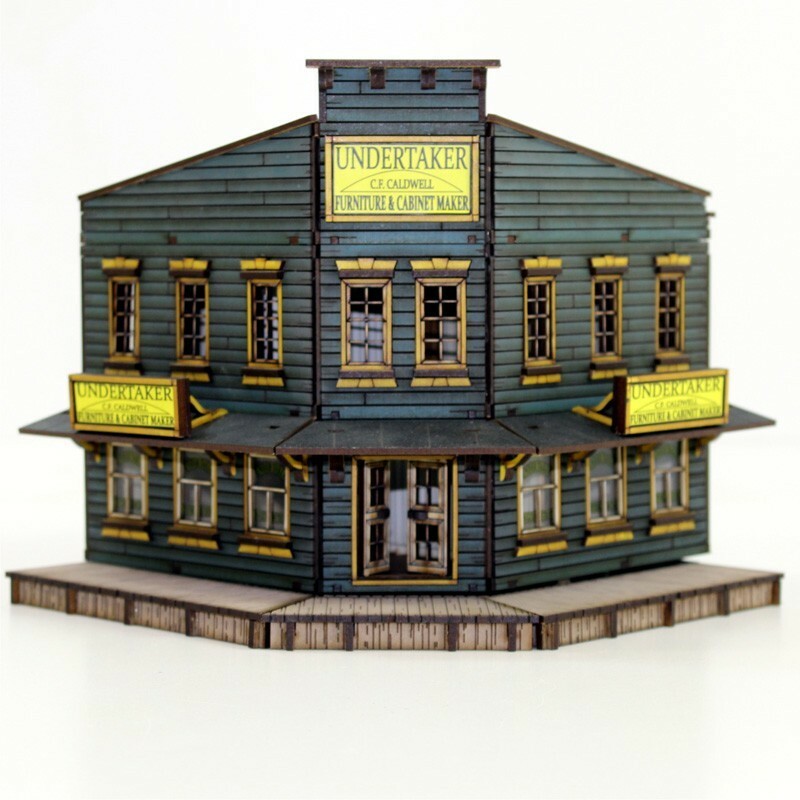 As befits a man of means such as the Undertaker this is one of the most extravagant buildings in Dead Man’s Hand. Where life is cheap and death can be had just playing a hand of cards, the Undertaker is one of the wealthiest folks in a town. Built from the earlier post and beam framing with clapboard siding, rather than cheaply balloon framed, its older style construction makes this building perfect for the 1830’s, 40’s and Civil War periods. This type of framing required carpenters, where as carpenters said ‘all Balloon Framing needs is lots of long milled timber and a bucket of 6” nails’. Our Undertaker was an apprentice served Cabinet maker, by trade the senior qualification for carpenters, so no wonder he opted for this more costly but more substantial form of timber framing. During the Civil War a large number of carpenters made boxes for burials and also worked for the Embalming Surgeons during their service. From this on the job training, and with the invention of formaldehyde in 1866, undertaking moved from being a job of necessity to a lucrative craft. Many of these men moved out west (where life was short) and earn ten times more than they would of done back east as furniture makers. Hardly surprising the Undertaker was one of the wealthiest people in town when charging between $4-$7 just for a plain box coffin, while also preforming funerals and hiring out morning wear to families they could charge lots more. For the Undertaker though the best business were lone gunmen and bandits where the sheriff would turn over all of the deceased’s belongings to fund a funeral. When one pistol is worth $25 'who's gunna' complain if you sell their stuff off for a plain box and no ceremony.